Struggling electric car maker Fisker Automotive has yet another thing in common with infamous solar panel maker Solyndra. Shortly after Fisker laid off 160 of its workers — or 75 percent of its staff — last Friday, law firm Outten & Golden hit the company with a class action lawsuit alleging that Fisker violated the Warn Act, which requires companies with 100 or more employees to provide at least 60-days notice before conducting mass layoffs or closing plants. I reported that Outten & Golden was investigating Fisker and interviewing employees last Friday, and Auto News has the full report of the filed lawsuit, as well as a PDF of the filing itself. Outten & Golden won a $3.5 million settlement against Solyndra using a similar suit. The suit, filed Friday in U.S. District Court in Santa Ana, Calif., against Fisker alleges that the company violated both federal and California state WARN acts, and the class action lawsuit was filed on behalf of lead plaintiff and former Fisker employee Sven Etzelsberger. The suit is asking for an unspecified amount of damages including unpaid wages and accrued holiday pay for 60 days, as well as legal fees. Fisker laid off 160 employees last week and has kept 53 around to negotiate with the Department of Energy and to work on selling its assets. 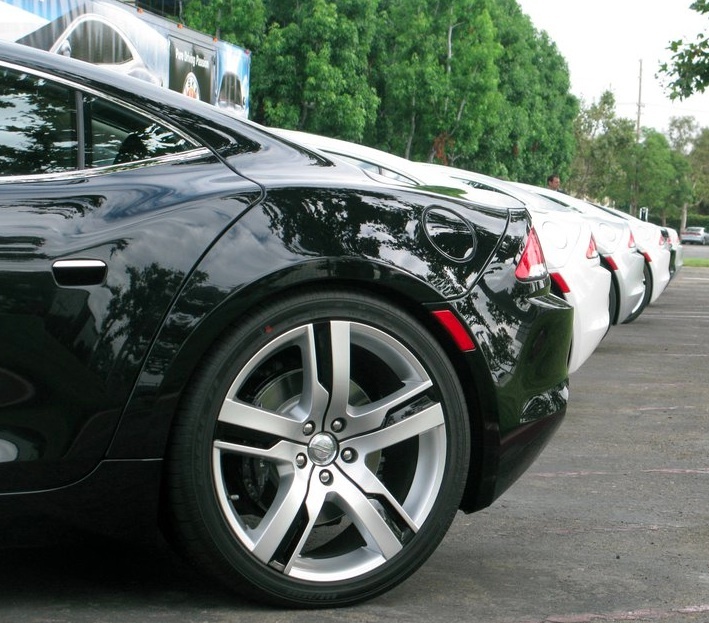 Fisker owes the DOE the first loan repayment at the end of this month for its $193 million loan. The company hasn’t made a car since the Summer of 2012, reportedly saw potential acquisition and investment bids from two Chinese auto makers fall through in recent months, and announced last month that its founder design Henrik Fisker had left the company over disagreements. Filing for bankruptcy is a very real next possible step for the company. Fisker has reportedly hired a bankruptcy lawyer to look at its options. Fisker has raised over a billion dollars in private funds, including money from Valley venture capitalists Kleiner Perkins and NEA. The company has sold a couple thousand of its $100,000 electric hybrid Fisker Karmas to customers, including celebrities like Al Gore, Matt Damon, Leonardo DiCaprio, Justin Bieber and the Game. Just one thing. The media needs to stop referring to Fiskar as an “electric car” or an “electric car company. Last time I checked an electric car did not come with a gas tank and a 4cyl engine. The Karma is (was) a beautiful car but it was hobbled by trying to be two things at once. If it had been a pure EV or a gas only car I think it would have made it. But with two power trains to haul around its performance and utility suffer. @G, I don’t think the gas tank was a big problem for them. The Volt is selling OK. People seem to like the ability to have extended range. @Tfill, They spent it, which is why they’re cutting costs by laying off workers and might declare bankruptcy. Fisker had the better idea but poor marketing. Tesla was already well established with its roadster. The Karma is a series hybrid, meaning gasoline engine is only used to power the generator, not directly power the car. This is still extremely energy saving, and much more conventional than an all-electric car. It’s still entirely possibly to make short trips with zero gas. And IMO it’s a better looking car.